good: 3 ½ stars. First off if you’re a Kate Morton fan you’ll love it. Definitely its strongest points were the weaving of Grimm style fairytales and a hidden garden into the story; I’m a sucker for both. Her characterizations are strong; Eliza Makepeace was terrific, definitely the most memorable of the lot. Other standouts included the simpering Rose & Adeline, her social climbing psycho of a mother. They were both so over-the-top weird, I found them fascinating. Look forward to see what you think of this one Florence. See you gave it 4 stars:) Thanks Dem! Thoughtful review. Glad you pioneered it for me. I desire to read more Aussie lit, so you help my choices. You pin the tail on the donkey with time hopping: "lets be honest she did it to death"--LOL. Michael wrote: "Thoughtful review. Glad you pioneered it for me. I desire to read more Aussie lit, so you help my choices. You pin the tail on the donkey with time hopping: "lets be honest she did it to death"-..."
Gillian wrote: "Great review, with quote at end, Florence..."
Thanks Gillian, moonlight shining in a room at night does look like cold wax, she can turn a phrase nicely can't she. Did you read it? Florence wrote: "Gillian wrote: "Great review, with quote at end, Florence..."
Thanks Gillian, moonlight shining in a room at night does look like cold wax, she can turn a phrase nicely can't she. Did you read it?" 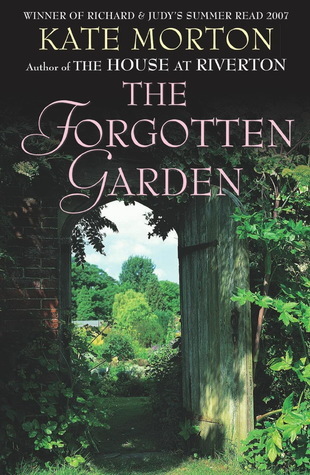 Agnes wrote: "Do you only read books with gardens in the title Florence? Lol"
Gillian wrote: "Florence wrote: "Gillian wrote: "Great review, with quote at end, Florence..."
Thanks Gillian, moonlight shining in a room at night does look like cold wax, she can turn a phrase nicely can't she...."
I'll keep an eye out for what you think of it Gillian! Melodie wrote: "Bravo! Great review!" Thanks so much Melodie, I liked yours as well! I am thinking of starting off with The Distant Hoursthis month. I have heard so many positive things about Kate Morton and I think that it's time that I tried some of her books. I agree, it would have been far better without the 2005 storyline, in fact, it may just be me but I'd have preferred to just read Georgiana and Eliza's tale from start to finish and not bothered with the 1975 story either for this one!